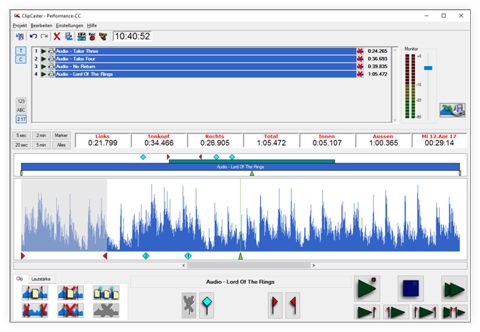 Intuitive, fast and secure production of audio reports, including recording, cutting, mixing and text editing: ClipCaster has been specially designed for radio reporters and editors. Each processing step is sample-accurate, non-delayed and can be carried out during playback and recording, whereby the result is immediately audible. Extensive import and export capabilities ensure easy integration into your work environment. 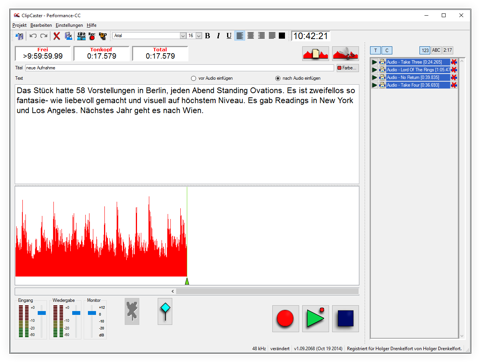 During the recording, text commentaries can be entered as accompaniment information, and markers can be set in order to immediately locate individuated positions. Audio material can be cut and merged quickly and easily. Volume curves can be freely edited. Fades and normalizations can be set. All work steps are effective immediately during playback. Direct quotes (o-tones) can quickly and easily be put together in a playlist for a contribution with intermediate moderation. During playing out the o-tones list, simultaneously speak your moderation, comments or translations. O-tones and recordings can be synchronized and merged by volume controls. A free trial version of the software and further information can be obtained by email to info@drenkelfort-audio.com.